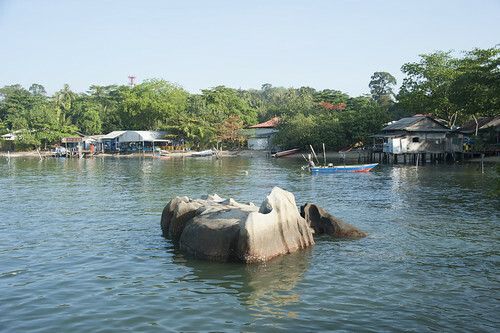 Pulau Ubin is an untouched island off eastern Singapore, home to the last 'kampung' (village). A visit takes you back to the simpler pleasures of the 1960's. And you don’t need your passport. Your first view of Ubin Town as you arrive at Ubin Jetty. With the Rhino Rock (or some say it looks like a sad dog). Escape to Ubin! Life in the slow lane starts as you join the queue for the bumboat that leaves Changi for the 15-minute ride to Pulau Ubin. 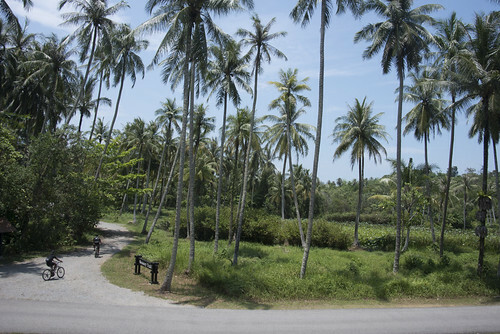 Stroll or pedal through rustic trails under swaying coconut palms, past quaint kampung houses with their kitchen gardens. Unwind as you explore meandering trails. Explore flourishing mangroves, lotus-covered ponds. Peek into hidden temples, stop by secluded beaches. Spot hornbills, wild boar and more. Chat with laid-back villagers as you enjoy a cold fresh coconut. On Ubin, the food tastes better, air is fresher, sights and sounds soothing to the soul. 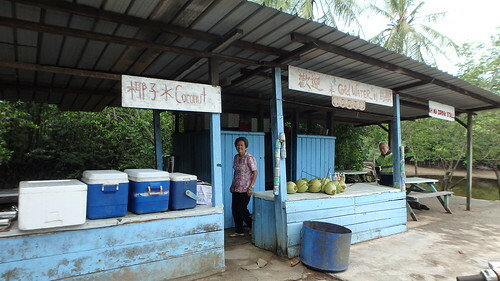 Ah Ma at her drink stall: for a cool drink plus stories about Ubin. Step 2: Take a bumboat to Pulau Ubin Cost of the bumboat: $3/person. Maximum 12 passengers. Additional $2 per bicycle. More details here. Step 3: Join the fun at Pulau Ubin! Here's more about what you can do on Pulau Ubin any day. On long weekends, expect long queues for the bumboats after 8am at Changi to Ubin; and after noon at Ubin to Changi. Parking may also be very limited at Changi after 8am. Carpool or take public transport. Even on normal weekends, the queue for the bumboat can be quite long after 10am at Changi to Ubin and near sunset at Ubin to return to Changi. Bumboat services wind down at sunset (around 7pm). Sometimes (not always) there is one boat providing services after that. If you plan to leave after sunset, make direct arrangements with a bumboat operator (when you arrive at Ubin) if you want to be sure of a boat. How to get around on Pulau Ubin?You can walk, cycle or take the Ubin 'taxi'. Here's a slideshow about getting around on Pulau Ubin. What to see and do on Pulau Ubin? Here's a sampling of the wonderful things to see and do at Pulau Ubin.